For the current schedule of adult classes, CLICK HERE. For the current schedule of children’s classes, CLICK HERE. 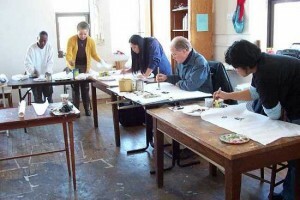 We offer excellent art classes! Our instructors are experienced teachers, renowned artists in their own right, who offer one-on-one attention to students and are able to instruct at your specific skill level. Beginner to experienced, hobbyist to pro, we keep our classes small to create a fun, low-pressure environment where you can grow as an artist! Our fees are comparable and often a better bargain than other art classes offered in the Baltimore area. We have evening, weekend, morning and after school classes available in a range of media. No excuses, time to create! Discounts for all classes are offered to seniors, college students with IDs and School 33 members. School 33 is currently accepting proposals for art classes and workshops to be taught here at the Art Center! For more information, please visit our application form or contact us at fwinchester@promotionandarts.com or (443) 263-4350.